After the cultural thaw that followed Stalin’s death in 1953, and particularly Khrushchev’s denunciation in 1956 and the launch of Sputnik 1 the following year, eastern-bloc cinema began to take a far greater interest in science fiction. The outstanding example from the late 1950s was Kurt Maetzig’s The Silent Star (Der schweigende Stern), a co-production between East Germany and Poland that in many ways anticipates Ikarie XB 1 in its vision of a future society built around international co-operation and notions of universal brother- and-sisterhood. The Silent Star had been adapted from an early novel by the Polish writer Stanisław Lem, who would go on to become one of the world’s most renowned and indeed most frequently filmed science fiction writers, especially after the publication of his best-known novel, Solaris, in 1961. Although it’s not acknowledged in the credits, the second big-screen Lem adaptation was in fact Ikarie XB 1, which was adapted from his 1955 novella The Magellanic Cloud (Obłok Magellana). Unlike many other works by Lem this has never been translated into English, although a plot synopsis reveals considerable similarities between book and film, both describing the world’s first truly interstellar mission and both incorporating a central set-piece involving the discovery of a long-dead vessel packed full of Cold War-era weapons. The screenplay was co-written by Jindřich Polák and Pavel Juráček, a much younger screenwriter (then still in his twenties) who would go on to become a significant creative figure in the then nascent Czechoslovak New Wave as both writer and director (Josef Kilián/Postava k podpírání, 1963; The Case for a Rookie Hangman/Případ pro začínajícího kata, 1970) as well as continuing to write or co-write screenplays for some of Czech cinema’s more imaginatively wayward talents - Karel Zeman’s A Jester’s Tale (Bláznova kronika, 1964) and Věra Chytilová’s Daisies (Sedmikrásky, 1966). Aside from a single bit of location shooting at a TV transmission tower, the film was shot almost entirely at Prague’s Barrandov Studios, placing much creative and logistical responsibility onto the shoulders of the veteran Jan Zázvorka, who had already notched up over a hundred production-design credits since the 1930s (including Krakatit,1948; Clown Ferdinand and the Rocket / Klaun Ferdinand a raketa, 1962 and Man from the First Century/Muž z prvního století, 1962). Cinematographer Jan Kališ is also credited as the head of the special effects team: while their work doesn’t quite rival the likes of 2001, by the standards of the early 1960s it’s distinctly above average. The music is by Zdeněk Liška (best known in the West for his many collaborations with František Vláčil and Jan Švankmajer, although that’s only a tiny fraction of his prodigiously prolific output), which alternates lush orchestral colourings with chirruping electronics and bizarre dance rhythms with more than a hint of Juan Garcia Esquivel’s then-contemporaneous space-age bachelor pad soundtracks. 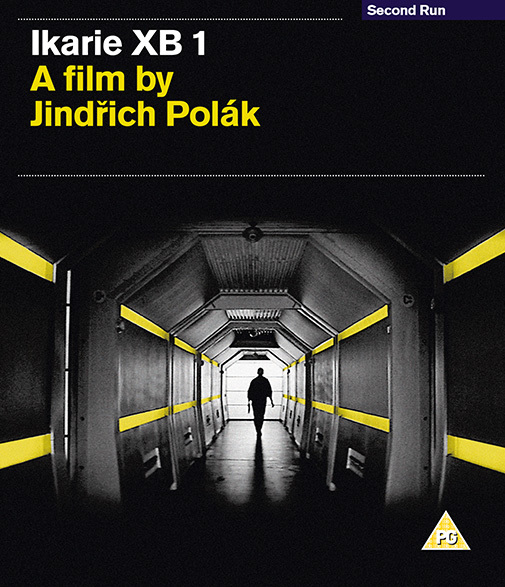 Although considerably less famous than Metropolis, Forbidden Planet, 2001: A Space Odyssey, Star Wars, Alien or Blade Runner, there’s a strong case for claiming that Ikarie XB 1 has been at least as influential, thanks to the fact that both Gene Roddenberry and Stanley Kubrick seem to have borrowed from it when making their own groundbreaking outer-space opuses. When Roddenberry pitched a concept that he initially described as “‘Wagon Train’ in space” to Paramount executives, he had two films in mind as models: Forbidden Planet and Ikarie XB 1, specifically the latter’s notion of a crew made up of multiple ages, sexes and nationalities, all working together in perfect harmony. As for 2001, Stanley Kubrick’s long-term assistant Anthony Frewin confirmed that Kubrick saw Ikarie when screening virtually every science-fiction film of any merit as part of his pre-production research for his own magnum opus. Kubrick had been fairly dismissive of much of what he saw (one of the reasons he decided to make 2001 in the first place was because of what he saw as a dearth of intelligent big-budget science-fiction), but he did reportedly think that Ikarie was “a half step up from your average science fiction film in terms of its theme and presentation”. Accordingly, several design and conceptual ideas found their way into 2001 - the spacesuits are very similar, as are the interior lighting, hexagonal corridors, videophone calls to loved ones, the amount of attention paid to non-narrative detail such as relaxation on the long journey, and the overarching theme of searching for unspecified (and never directly depicted) alien intelligence beyond the further reaches of our solar system. Michael Brooke's complete essay, from which this excerpt is taken, appears in the booklet which accompanies the release. © 2005 - 2019 Second Run. All Rights Reserved.